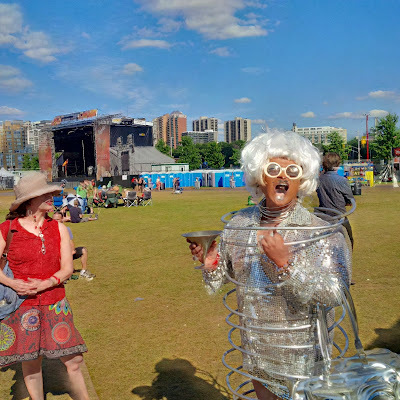 Shanghai restaurant on Somerset Street West near Bronson is home to China Doll, the infamous Ottawa drag performer who hosts karaoke every week and every New Year's Eve—each time in a different, outrageously fun outfit. Anyhow, whatever your plans are, have a happy new year! There was a brief period in the design for the Bronson Avenue reconstruction when the consultants responded to residents' desire for more trees by suggesting fake metal 'trees' to provide shade to pedestrians, since there would be no room for real trees in the widened Bronson Avenue. Thankfully, this suggestion was short lived, and circumstances changed to permit a lot of real trees. Across from the Rideau Centre's food court a couple of weeks ago, I noticed this row of branches lined up outside the entrance to 45 Rideau Street, next to the Chapters. It looks like they have been lined up as fake 'trees' to provide a structure on which to mount decorative lights. In fairness, if these were real trees they wouldn't have leaves at this time of year anyway. I was doing some research for a post about sidewalks that I'll hopefully pull together one of these days, when I came across this entry in the 1896 City of Ottawa by-law book, "to provide for borrowing money by the issue of debentures secured by special rates, for the construction of an artificial stone sidewalk as a local improvement on Elgin Street in the City of Ottawa." There are a few things that get my geek on with this: The first is that this is the same section of sidewalk where two squares of sidewalk survived until just a few years ago. In the other blog post, I said that my friend (who now blogs himself) recalled that sidewalk having a plaque dating it to 1905. I am not sure if perhaps he misremembered the year, or if the sidewalk was re-done in 1905 (the by-law books of that decade didn't give any clear information). I'm composing this far too late to type out the entire thing, but if anyone wants to do it and put it in a comment, I'd be happy to add in the text. The next photo shows in 3D what you can't see in the 2D equivalent (linked immediately below the photo): that the curbs (under the orange tarps) are higher than the sidewalk bed behind them. It was a bit of a mess at the Metcalfe end of the block while all this was sorted out. The following week, the road and sidewalks were stripped of the snow and graded with asphalt. It was probably the least snowy street in Ottawa (even if it was also the least-paved one). This excavator has a neat side-to-side pivot on its bucket. The sidewalks have been paved in asphalt temporarily for the winter, using this miniature asphalt layer vehicle (like the ones used for roads, but only about six feet wide). This might be my first attempt at nighttime 3D photos with flash, and I'm glad with how it turned out. The remaining three blocks between Bank and Cartier will be done next year, as will the finishing work on this block. It'll be a big improvement over how it used to look: an excessively wide street with no trees, lots of potholes, and narrow sidewalks. It's been a while since I did a straight-up residential photo for my 3D Thursday series. Here's a nice shot of some trees on Preston Street on the first snowfall of the season, which happened to be on Saturday, November 9, the day of the Plant Pool Recreation Association's annual Dessert Party. The PPRA raises funds to allow children to participate in recreational programming who might not otherwise be able to afford to. 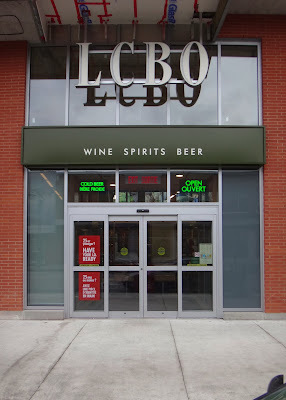 Yes, there are decorations on streetlamps, lights in store windows, and powdery white snow on the ground, but last week's opening of the new LCBO at Bank and McLeod has not just spirits, but also wine and beer. Ottawa Citizen columnist Joanne Chianello sparked a twitter conversation earlier this month about the location, and the relatively uncommon location of this LCBO at the base of a condo tower (certainly unprecedented in Ottawa). 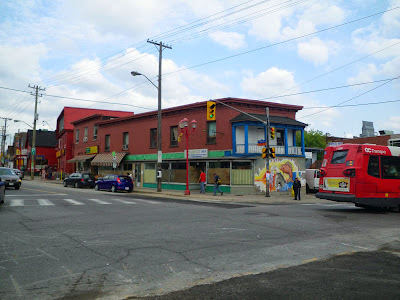 Meanwhile, the LCBO 7 blocks down Bank Street in the Glebe, which would be visible from the Bank and McLeod location if not for the Queensway, isn't going anywhere anytime soon, apparently. (Sadly, all three of the large ash trees in front of that location succumbed last year to the Emerald Ash Borer beetle infestation). Equidistant from those two locations, the LCBO next to the Loblaws on Pretoria is being rebuilt in the location of the former Beer Store (which, by contrast, is closed permanently) with nothing but air above it. There is also supposed to be an LCBO at the new Lansdowne Park big box plaza/mall. There's a lot I can't comment on by the mere fact that I don't drink alcoholic beverages, but it's still an interesting case study in terms of, "what do you put in a mid-size mainstreet commercial space when there's already a Shopper's Drug Mart only a block away?" 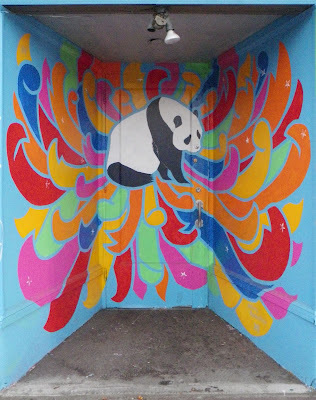 As with the other panda, this was done as part of the storefront mural project that runs throughout Chinatown. After the store closed, it was papered up from the inside. For a number of years it made the corner pretty dead, and it has only been used for storage for one of the nearby businesses. I've heard it speculated that this unsightly building contributed to the failure of the Chi Developments' 288 Booth condo project diagonally across the street, which was an attempt by an amateur developer to rebuild on the lot left vacant by a fire took in August 2007. In early June, the mural was still in its early stages. White flowers on their own represent death, which—while perhaps reflective of the level of activity of this space—doesn't contribute to the goals of livening up the street with murals. With a few blue and bright pink flowers as highlights, the mural has been a welcome splash of colour since it was finished (and retouched after a graffiti attack). The flowers are just scenery; the real surprise is when you're walking down the sidewalk and the panda pops out at you! I encourage you to head down to Chinatown to check out the artwork on the many doors, walls and storefronts on Somerset Street between Bay Street and Preston Street. Leigh and Karen from Highjinx have added seasonal decorations to many of the store windows, and the Somerset Chinatown BIA has installed red and white Christmas lights to many of the buildings. A great place for a Christmas lunch or dinner for your office, family and friends! I took a number of photos during this year's rainy-but-well-attended Nuit Blanche Ottawa+Gatineau on September 21/22, but only two 3D photos. I no longer have two cameras and it's hard to take a pair of stills with moving people in the shot. You can see the two exposures by closing one eye, then the other. I think between exposures, a couple of the lights were turned off in the condo building in the background. The next one is a photographic sculpture by Susy Oliviera at SAW Gallery, called Have Everything and Die. The wall behind was red, so I didn't even bother trying to do the 3D conversion in colour (but I've left the colour in the source photos below). That's a pretty important part of the piece that you don't get with a regular photo of the sculpture. But a really neat thing about the 3D photos is if you flip your 3D glasses around (i.e. the red filter on your right eye instead of your left eye), it looks convex! This is a neat twist on the old paper dragon illusion or the rotating mask illusion. The description says that it's made up of 3,144 bicycles, and the title is a play on the name of China's largest bicycle brand, Yong Jiu, which translates as "forever". They're not real bicycles, but rather a steel representation of bicycle frames. But the wheels are real bicycle wheels and they all spin freely! Truly mesmerising! A shame I couldn't get this shot in 3D!